I don't usually bake at 6:30 in the morning but I was craving banana chocolate chip muffins and also needed something sweet for Shane to take in his lunch. What I didn't count on was the kitchen help I would find when I got the mixing bowls out. Mix flour, baking soda and salt in a large bowl. Make a well in the center of the bowl. In a separate bowl, cream the butter and mix in the sugar and 1 egg. Beat in the second egg. Mix in the sour cream and bananas. Pour mixture into the well. Mix well, but leave lumps. Add chocolate chips. Spoon into muffin cups(I do not use paper baking cups)about 3/4 full. Bake for 20 to 25 minutes at 400 F until golden brown. Look closely and you will see signs that while summer blazes on, fall is quietly announcing its arrival. As the girls are much more active and busy than last school year, I wanted to plan activities and learning play just for them to help focus their attention and busy hands on practical skills, especially for Kate. So I turned to what I know best for meeting this need, Montessori learning. There are so many great websites for homeschooling parents to glean and gather ideas from. In addition, I purchased an e-book from Montessori at Home which gives a ton of learning help for parents looking to incorporate the well-known Montessori ideas in their own home. I'm in the process of selecting some items from Montessori Services to have utensils and containers for the girls' little hands to manipulate and practice with. Most of these activities are considered Practical Life skills like pouring and transferring. And the more formal learning of letters, numbers, colors, etc. will be worked into this type of play learning. Laura is already counting fairly accurately up to five and showing an interest in letters. I hope to take advantage of her interest and her abilities to help Kate develop further as well. A week or so ago I set up an outside table with bowls of water and various scooping and ladling utensils borrowed from our play kitchen stuff. Everyone had a blast, pouring the water from one container to the next and back and forth, eventually soaking everything in sight. It was a glorious, watery mess. Both girls still put things in their mouths, so I will have to modify some of the transferring activities until they grow out of this stage. While these activities are mostly meant for the girls, I do have some things that only Seth will be able to work with and practice his coordination and concentration skills with. I think he will enjoy it as they will enable him to do more independent things in the kitchen as well as handwork learning. A long-term benefit to many of these coordination activities like transferring, is building muscle strength in the fingers and hands which enables better handwriting endurance, especially in boys. In preparation for this busy learning, I have rearranged some furniture to make the area more little-girl-friendly. I also have simplified the items on the lower shelves so they are not so crowded and jumbled. I plan to arrange some of the newer activities on these shelves so that they work right there at the table and learn how to put things back properly. Both girls understand how to put stuff away, but need a lot of coaching to do it properly and completely. That's a life skill in itself, just ask any grown-up! I'm excited for the girls as they learn and practice new skills this coming year. It will be fun to watch them figure all this out and develop good coordination at the same time. If you have any thoughts or ideas, please share! P.S. Yes, Kate was standing on her own two feet outside at the table to play with the water!! Progress is slow but steady! 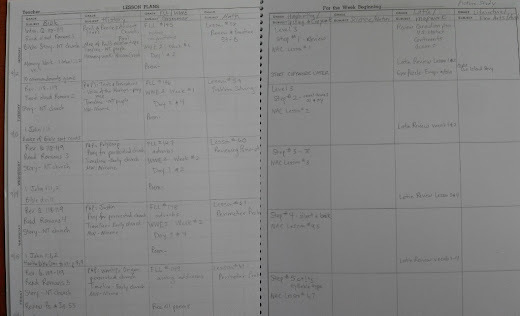 Several weeks ago I posted part of my homeschool to-do list and I have been working very hard to cross items off. It feels great to get lessons planned and ideas thought out ahead of time. I'll post the original list with my updated notes after each item in green and in between, I'll sprinkle photos of our books that we will be using this year. * I have Year 2's narration selections picked out with only the last 4 weeks to select. I really enjoyed going through our books and finding appropriate selections to match the elements studied for that week.(i.e. titles of respect, prepositions, commas in a series, etc.) I think Seth is going to enjoy the selections so much that he will want to read the other parts of the book and thus his free reading lists will grow and grow. I'd like to work quickly through Year 2 and start on Year 3, so I've tentatively planned on us covering 2 days of work for each day. We'll see how the pace goes, but I think he will find the narration simple enough to then work on the copywork the same day. Again, we'll see. My selections vary from children's classics, to poems, to historical biographies to science biographies. I'm excited about the wide exposure we will have to literature by working through this program. - Watch Teaching the Classics dvds and read through accompanying text. * I have started watching the dvds and I think a little more time and we will be ready to start reading and discussing our first book together. I plan on working through the syllabus selections myself so that I am comfortable with the terms and what to look for in the selections. 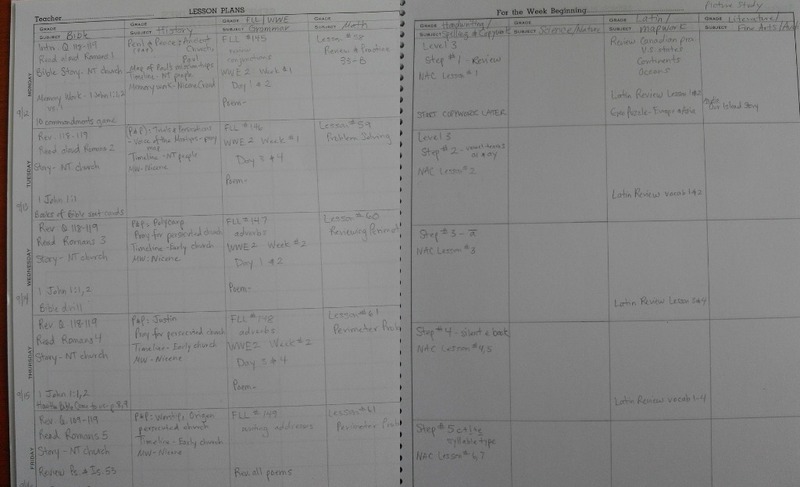 I have nothing planned in this for the first week so I still have time to work through the materials. - Select new poetry for memory work, liking Henry Wadsworth Longfellow a lot right now. Looking into other books in series for ideas. * I like the Poetry for Young People series, but not every poet has been my thing. So far, Longfellow and Emily Dickinson have been my two favorites and I am working on getting our own copies from this series. I also plan on getting a poem anthology book to broaden our poetry horizons. I love Helen Ferris Tibbet's, Favorite Poems, Old And New. I read the introduction online and loved her memories of her upbringing on which many of the poem selections are based. -Adding to Memory Work list, Nicene Creed (Presbyterian version), Book of 1 John. * Both are in the plans. - Go over Heidi's Book Lists compiled from her website into my own list mashed with other found reading lists. It's a rough, rough draft, but if you're interested I can clean it up a bit and email it to you. *I'm still working through these lists, but I've moved it back in the priority list as the document is in good enough shape for me to use right now. I hope to finish it and post it after I finish getting my lessons planned. * I have done some work in our main curriculum(for more info see my science page)and would like to get some more lessons planned before we re-start for this year. Also, I have looked through the Beautiful Feet History of Science Guide and printed off the lessons for Ancient and Medieval Science, saving Modern Science for next year's study. I don't have all the books I purchased here with me yet, as they were shipped to my parents', but I did read through the lessons so that I can organize quickly once I have the books in hand. I received the Science Guide as a free download choice as part of a subscription offer through The Old Schoolhousemagazine. I really like how the Guide will help us include scientists and inventors in our study of history and our wall timeline as well as understand how modern science understanding is rooted in historical science. - Finish Seth's Chore Schedule. (just a few household chores to encourage a good attitude for work; gleaning from Created for Work. * I have it on paper, but haven't created a document for him to see yet. I want him to know how to work well and to enjoy it. It's not necessarily an academic goal, but it certainly includes his academic studies. We'll see how this unfolds over the course of the year. - Working on History lessons through The Middle Ages. (I rearrange order of lessons) Made it up to the Vikings so far. Incorporating church history people and events. Will post resource list soon. * I have spent the bulk of my summer hours working on our history lessons and I am pleased to only have 200 more years to go through of the official Middle Ages. The end is in sight and the church history planning is mostly done as well! - Printing figures for our wall timeline. * With the exception of a few stray figures that may need to be added as we study, everything is sized and printed and ready to be cut and hung by Seth as we study. There are things not pictured or mentioned here like our Math, Latin, Catechism, etc. but they have remained the same content from last year and can be seen individually on the pages in the left sidebar under What We Do for Homeschool. Above all, it is my desire that my children learn to know and love the Word of God, so while other studies may fall behind, I try to not skip or skimp over our time in the Word. We sing hymns, we read passages, we recite aloud and we pray together. And if that is the only learning done all day, I cannot count it a loss but only a gain. We have a new little girl in town! 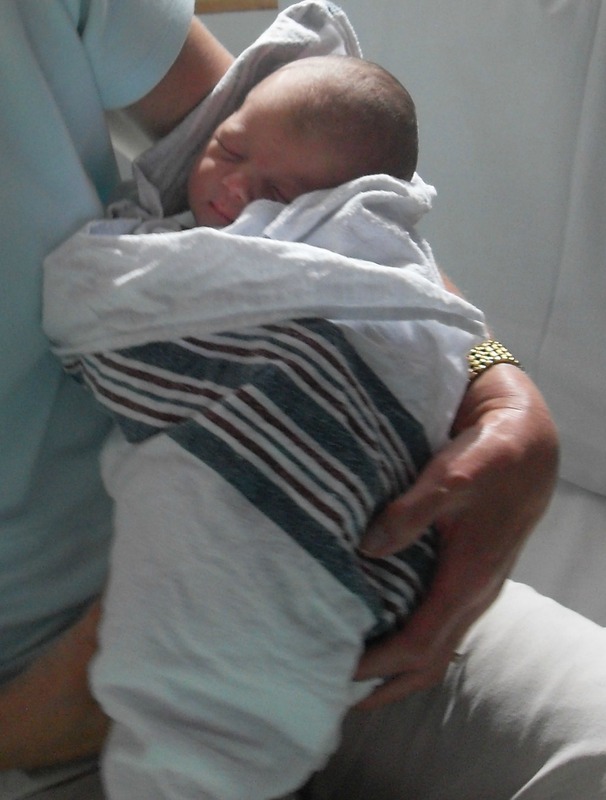 Miss Tessa Joy arrived safely Thursday evening in answer to many prayers and much delight. She belongs to Shane's twin brother, Joel and his wife, Karla. I haven't been able to hold her yet but I just love her so much and I am so happy she is finally here! 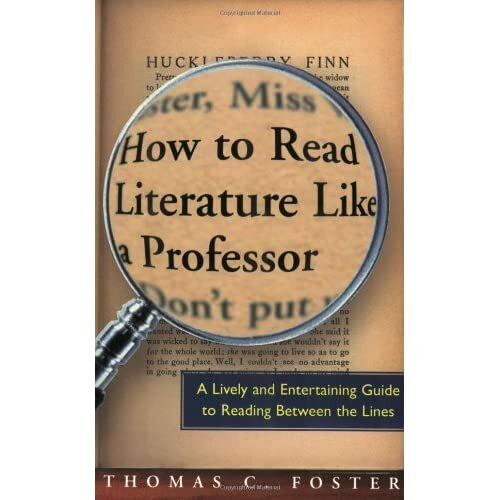 From How to Read Literature Like a Professor that I just started last week. Once or twice a semester at least, I will stop discussion of the story or play under consideration to intone(and I invariably intone in bold): whenever people eat or drink together, it's communion. For some reasons, this is often met with a slightly scandalized look, communion having for many readers one and only one meaning. Here's the thing to remember about communions of all kinds: in the real world, breaking bread together is an act of sharing and peace, since if you're breaking bread you're not breaking heads. One generally invites one's friends to dinner unless one is trying to get on the good side of enemies or employers. We're quite particular about those with whom we break bread. We may not, for instance, accept a dinner invitation from someone we don't care for. The act of taking food into our bodies is so personal that we really only want to do it with people we're very comfortable with. As with any convention, this one can be violated. A tribal leader or Mafia don, say, may invite his enemies to lunch and then have them killed. In most areas, however, such behavior is considered very bad form. Generally, eating with another is a way of saying, "I'm with you, I like you, we form a community together." And that is a form of communion. So too in literature. And in literature, there is another reason: writing a meal scene is so difficult, and so inherently uninteresting, that there really needs to be some compelling reason to include one in the story. And that reason has to do with how characters are getting along. Or not getting along. Come on, food is food. What can you say about fried chicken that you haven't already heard, said, seen, or thought? And eating is eating, with some slight variation of table manners. To put characters, then, in this mundane, overused, fairly boring situation, something more has to be happening than simply beef, forks and goblets. My zucchini plants have been flowering well but not bearing any fruit and since I suspected that pollination is the issue, I decided to help out the busy bees. Here there are two blooms, a male and a female open at the same time. This is a perfect time to hand-pollinate. The male flower with no fruit behind it. The female flower with the mini zucchini already growing but needing further pollination to mature. To help with the pollination, I simply used a q-tip to get some of the sticky pollen off of the male flower and transfer it to the female flower(shown). Two days later, the bloom fell off and the zucchini is growing. A few more days, and I can pick it anytime now. And here is another zucchini growing with a little help from the q-tip bee.